The Choice of Banff Accommodations for you To Stay in Banff National Park. When you decide on Banff accommodations for your next trip to Banff National Park, you will have wide range of options to choose - from high end resorts/lodge, or moderate hotels, condo suites, or bed and breakfast, rustic cabins, economic hostels or campground. Banff and Lake Louise Accommodations offer any price range for everyone! The majority of Banff hotels in the park are located right in and near by the Banff townsite. The rest are in the village of Lake Louise. There are few lodges in elsewhere in the park – lodging at ski hill and backcountry lodging – remote mountain lodges where you only can reach by horse riding, cross-country ski or foot. With so many choices of Banff and Lake Louise accommodations out there, you are probably wondering which one to choose to stay. Let us help you sort them through first to give you a good idea what your preferences are. Most of Banff Lake Louise accommodations locate in and near the downtown of Banff where you will have lots things to do and see. If you like to enjoy nightlife and shopping after you come back from day trip, hiking, or skiing, one of hotels in Banff townsite is a good place to stay. If you consider to stay in and near Banff townsite, click here you can find out exclusive luxury and moderate hotels in Banff. If you would like to stay in Lake Louise area, click here to find luxury and moderate hotels in Lake Louise. Banff National Park is also home to several backcountry lodges - ideal Banff Accommodation for those looking to pamper themselves while exploring the wild. These remote mountain lodges only can be reach by hiking, horse riding, or cross-country ski in winter. Sundance lodge -located at the base of Sundance Range next to Brewster Creek, 16 km from the town of Banff. The lodge has 10 sleeping rooms, holds up to 20 people and makes a fine ski-in destination near 10 km from Healy Creek. Brewster's Shadow Lake Lodge - a remote backcountry lodge with cabins, situated in the high alpine meadows of Banff National Park, next to a piece of heaven Shadow Lake. Well established trails lead through vast meadows to mountain passes and down to adjoining valleys. Advance reservations are required. Lake O'Hara Lodge - located in a secluded alpine valley in the spine of the Canadian Rockies, restricted access to Lake O’Hara allows you to experience the beauty, tranquility and magic of the mountains that few other places can. Famous for its simplicity and rustic charm, It offers comfortable and cozy accommodation, replete with superb dining and service. Mt. Assiniboine Lodge - located adjacent to Banff National Park in Mount Assiniboine Provincial Park, B.C. It is accessible only by helicopter, hiking, or skiing. 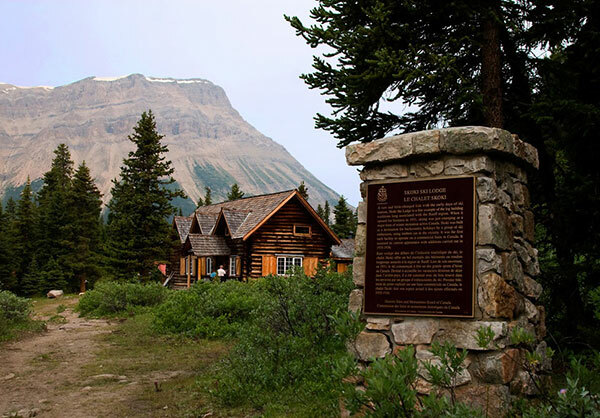 Skoki Lodge - situated in a beautiful high alpine region in Banff National Park. The eleven kilometre trail from Lake Louise to the Skoki Valley makes Skoki Lodge an ideal destination for hikers and skiers of all levels. From Skoki Lodge one can access breathtaking mountain ridges and alpine lakes, or explore five different adjoining valleys. Backpacker hostels in Banff / Lake Louise are the ideal choice for any budget traveler. Normally, bedroom and bathrooms are shared. Some of Banff youth hostels have the choice of private rooms and en-suite bathrooms. There are numbers of Hostels in Banff National Park for you to choose. When you camp in Banff National Park, all of the activities of the Rockies are literally on your doorstep. There are number of campgrounds for tents and RVs. Campgrounds in Banff also fill up fast. Since you can't reserve a site at a frontcountry campground, you need to plan which campgrounds to stay in advance to avoid disappointments. Click here you’ll find helpful information on where to camp in Banff. Just remind of you that there are 4 million visitors yearly in Banff. Once you decide to come to Banff National Park, the earlier you decide where you stay, the better chance to get the kind of Banff accommodations you want. Hotels in Banff are extremely busy in summer from mid June to early September. So book ahead.